Julie Tower-Pierce is an attorney, mom, writer and author. She will serve as both faculty and resource facilitating a workshop called, “Staying at Home, Staying in the Law” at Solo Practice University®. Julie is an attorney, mom of three young children, writer and author of Staying at Home, Staying in the Law: A Guide to Remaining Active in the Legal Profession While Pursuing Your Dreams. 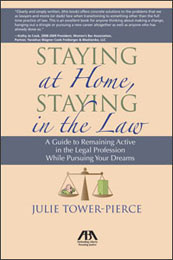 Julie’s popular book is the ultimate companion for lawyers who dream about making career transitions or taking career detours to pursue dreams beyond the law, such as stay-at-home parenthood or entrepreneurial dreams, but fear that doing so means sacrificing the law and all they’ve achieved. The appeal of Staying at Home, Staying in the Law extends beyond ‘Mommy’ and ‘Daddy’ Lawyers and GenYers; it also caters to lawyers who have taken extended timeouts from the law and want back into the law on their own terms. 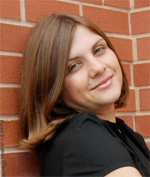 Julie earned her Bachelor’s Degree in Women’s Studies from Dalhousie University, and her J.D. and Masters Degree from Vermont Law School. She is admitted to practice in Vermont and the District of Columbia. She currently resides in the Washington, D.C. metropolitan area. Until 2006, Julie worked as an associate attorney at the respected law firm of Tarrant, Marks & Gillies in Montpelier, Vermont. As an adjunct professor at Norwich University, a private military university, Julie has taught courses in Cybercrime and Cyberlaw and Courts and the Criminal Justice System, and served as a capstone advisor to justice administration graduate students. Her legal background includes work in the areas of business and privacy law, regulatory compliance and criminal defense. Along the way, she has gathered legal experience via “flexible” legal stints that have resulted in blissful work/life balance well-matched for raising family without the burden of overwhelming ‘professional or mommy guilt’ – though she admits that she still hasn’t found a 100% guilt-free path in the law and parenthood. In law school, Julie served as Articles editor of the Vermont Law Review, as a senior staff editor of Vermont’s Journal of the Environment, and as a legal writing Dean’s Fellow. She has served on the editorial boards of the American Bar Association’s Young Lawyer and the Norwich University Journal of Information Assurance, and as a contributing editor to the SANS Business Law and Computer Security course. Julie’s freelance writing and legal/technology commentary have appeared in a number of publications including SANS NewsBites, Information Security Magazine, I AM Modern, the Vermont Law Review, the Vermont Bar Journal, and KIWI. Her essays have been syndicated by the McClatchy Group, appearing in online and print publications, such as the Miami Herald and the Charlotte Observer. She previously penned a regular legal/technology/business column in a Vermont business publication. When Julie’s not chasing after her children, she spends much of her time writing and blogging about the law, technology, flexible lawyering and motherhood. Her blog, Darling Hill, what she calls a “stay at home, work from home, and part-time lawyer hangout,” reflects her passion for helping lawyers find their ideal work/life balance in the law and stay connected to the law while pursuing their dreams. Inspired by Julie’s book, Staying at Home, Staying in the Law, this class is designed for lawyers who have embarked upon a career timeout (whether or not by choice), are considering off-ramping, or are would like to ratchet up their resumes for an eventual return to the law but aren’t sure where to begin. It’s also designed for ‘mommy and daddy’ lawyers who want a career timeout, hope to re-enter the profession again, or think they might like to hang their own shingle someday–or even tomorrow. Course Objective: Develop a plan for connecting or reconnecting with the law on your own terms, whether that plan involves dabbling in the law, hanging a part-time shingle, pursuing an alternative career that puts your J.D. to work, or launching your own business. 1: What are your dreams and where does the law fit in? It’s hard to imagine that a lawyer who has survived law school, with or without experience under the belt, could ever wonder what direction s/he should take life or the law. However, life changing events, like the birth of a child, a layoff, a gloomy job market, or boredom/frustration with the practice of law can provoke such introspection and stir doubt about career choices. Discussion topics include: self-assessment, life and career goals, the slash identity, “mommytrack” stigma & other on & off-ramp concerns, professional/parenting guilt, work/life balance. 2. Ditch the Guilt. Whether voluntarily or involuntarily, you’ve decided to take your career in a new direction, try a career detour, or look for the legal onRamp after a timeout–but guilt wants to come along for the ride. Guess what? You’re not the first–and certainly not the last–lawyer to experience professional and personal guilt. In this session, discover the straight scoop on guilt and tips to beat profession-induced guilt and parent (work/life balance) guilt, so you can more confidently pursue your dream path in the law. 3: Full-time vs. career suicide: What are your options? This session explores full-time practice alternatives, including part-time practice and non-traditional career paths, and aims to help lawyers think about creative ways to engage the law on their own flexible terms. It will examine case studies of “lawyers redefined” – i.e. lawyers who have off-ramped and lawyers who have successfully on-ramped, and discuss the pros and cons of flexible alternatives. 4: The Secret to Making Life and Law Success Work on Your Own Terms: Self-Investment. This session will introduce the “secret” for making life and law work: self-investment. This session will tackle commonly cited hang-ups and obstacles (e.g., money, childcare) about off-ramping, reconnecting to the law, or staying involved in the law while off-ramping. It will encourage lawyers to position themselves for their ideal work/life arrangement, even if that position is seated on the sofa during baby’s naptime. Turn the work/life dream into reality with the help of other lawyers. Brainstorm plan, network with other lawyers with similar priorities, eliminate “isolation” factor, and strategize ways to stay committed to the law while focusing on other priorities/dreams.